Congressman lists launching probes on Clinton, Benghazi, IRS among his key accomplishments. Leah Hogsten | The Salt Lake Tribune Rep. Jason Chaffetz, seated next to his wife Julie, told members of the media at his home in Alpine during an impromptu press conference that he was leaving Congress to spend more time with his family. Chaffetz announced Thursday May 18, 2017 that he will step down from office June 30. In a letter to constituents, the Utah Republican and chairman of the House Oversight and Government Reform Committee, said he did not want a "lifetime career" in Congress, although it is rumored that he is in talks about a job with Fox News and hasn't ruled out a race for Utah governor in 2020. Leah Hogsten | The Salt Lake Tribune Rep. Jason Chaffetz, seated next to his wife Julie, told members of the media at his home in Alpine during an impromptu press conference that he was leaving Congress to spend more time with his family. Chaffetz announced Thursday May 18, 2017 that he will step down from office June 30. In a letter to constituents, the Utah Republican and chairman of the House Oversight and Government Reform Committee, said he did not want a "lifetime career" in Congress, although it is rumored that he is in talks about a job with Fox News and hasn't ruled out a race for Utah governor in 2020. Leah Hogsten | The Salt Lake Tribune Rep. Jason Chaffetz, seated next to his wife Julie, told members of the media at his home in Alpine during an impromptu press conference that he was leaving Congress to spend more time with his family. Chaffetz announced Thursday May 18, 2017 that he will step down from office June 30. In a letter to constituents, the Utah Republican and chairman of the House Oversight and Government Reform Committee, said he did not want a "lifetime career" in Congress, although it is rumored that he is in talks about a job with Fox News and hasn't ruled out a race for Utah governor in 2020. Leah Hogsten | The Salt Lake Tribune Rep. Jason Chaffetz told members of the media at his home in Alpine during an impromptu press conference that he was leaving Congress to spend more time with his family. Chaffetz announced Thursday May 18, 2017 that he will step down from office June 30. In a letter to constituents, the Utah Republican and chairman of the House Oversight and Government Reform Committee, said he did not want a "lifetime career" in Congress, although it is rumored that he is in talks about a job with Fox News and hasn't ruled out a race for Utah governor in 2020. 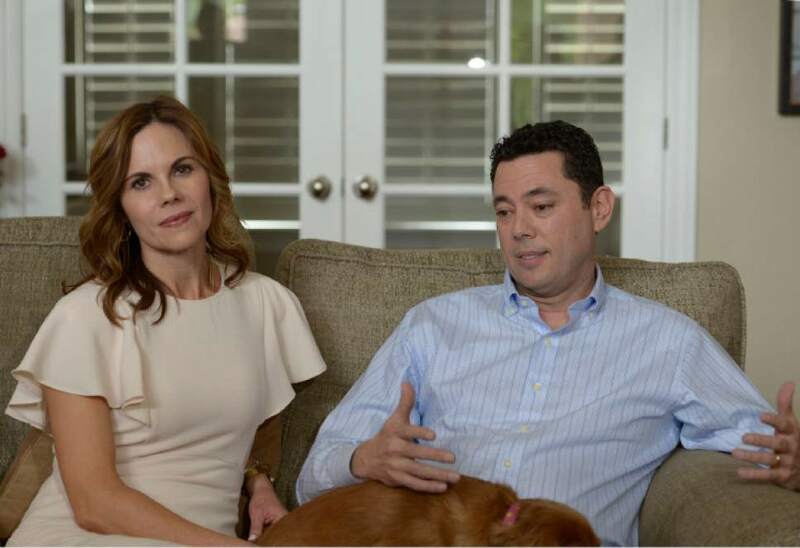 Leah Hogsten | The Salt Lake Tribune Rep. Jason Chaffetz, seated next to his wife Julie, told members of the media at his home in Alpine during an impromptu press conference that he was leaving Congress to spend more time with his family. Chaffetz announced Thursday May 18, 2017 that he will step down from office June 30. In a letter to constituents, the Utah Republican and chairman of the House Oversight and Government Reform Committee, said he did not want a "lifetime career" in Congress, although it is rumored that he is in talks about a job with Fox News and hasn't ruled out a race for Utah governor in 2020. 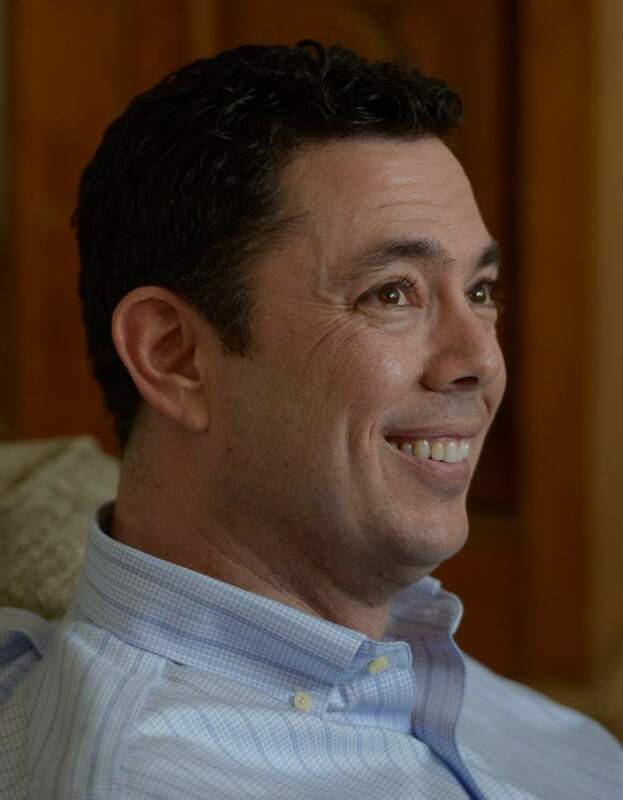 Leah Hogsten | The Salt Lake Tribune Rep. Jason Chaffetz tears up while counting the events in his family's life that he's missed. Chaffetz told members of the media at his home in Alpine during an impromptu press conference that he was leaving Congress to spend more time with his family. Chaffetz announced Thursday May 18, 2017 that he will step down from office June 30. In a letter to constituents, the Utah Republican and chairman of the House Oversight and Government Reform Committee, said he did not want a "lifetime career" in Congress, although it is rumored that he is in talks about a job with Fox News and hasn't ruled out a race for Utah governor in 2020. Leah Hogsten | The Salt Lake Tribune Rep. Jason Chaffetz told members of the media at his home in Alpine during an impromptu press conference that he was leaving Congress to spend more time with his family. Chaffetz announced Thursday May 18, 2017 that he will step down from office June 30. In a letter to constituents, the Utah Republican and chairman of the House Oversight and Government Reform Committee, said he did not want a "lifetime career" in Congress, although it is rumored that he is in talks about a job with Fox News and hasn't ruled out a race for Utah governor in 2020. 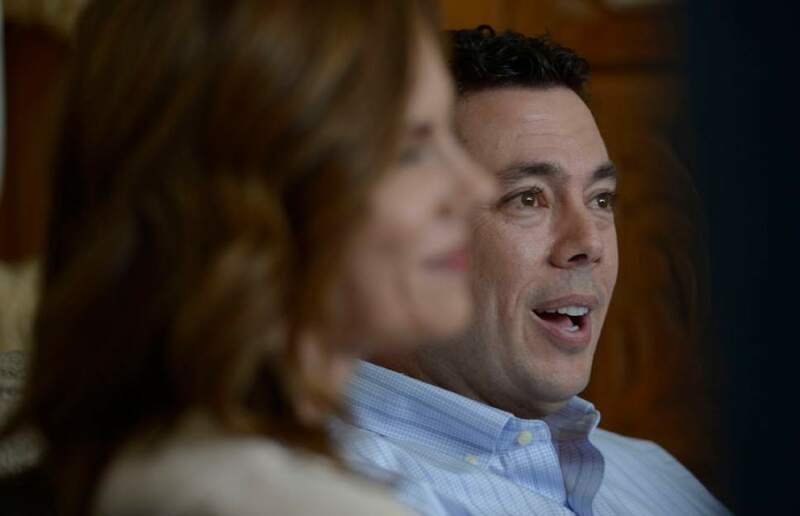 Leah Hogsten | The Salt Lake Tribune Rep. Jason Chaffetz, seated next to his wife Julie, told members of the media at his home in Alpine during an impromptu press conference that he was leaving Congress to spend more time with his family. Chaffetz announced Thursday May 18, 2017 that he will step down from office June 30. In a letter to constituents, the Utah Republican and chairman of the House Oversight and Government Reform Committee, said he did not want a "lifetime career" in Congress, although it is rumored that he is in talks about a job with Fox News and hasn't ruled out a race for Utah governor in 2020. Leah Hogsten | The Salt Lake Tribune Rep. Jason Chaffetz, seated next to his wife Julie, told members of the media at his home in Alpine during an impromptu press conference that he was leaving Congress to spend more time with his family. Chaffetz announced Thursday May 18, 2017 that he will step down from office June 30. In a letter to constituents, the Utah Republican and chairman of the House Oversight and Government Reform Committee, said he did not want a "lifetime career" in Congress, although it is rumored that he is in talks about a job with Fox News and hasn't ruled out a race for Utah governor in 2020. Leah Hogsten | The Salt Lake Tribune Rep. Jason Chaffetz, seated next to his wife Julie, told members of the media at his home in Alpine during an impromptu press conference that he was leaving Congress to spend more time with his family. Chaffetz announced Thursday May 18, 2017 that he will step down from office June 30. In a letter to constituents, the Utah Republican and chairman of the House Oversight and Government Reform Committee, said he did not want a "lifetime career" in Congress, although it is rumored that he is in talks about a job with Fox News and hasn't ruled out a race for Utah governor in 2020. 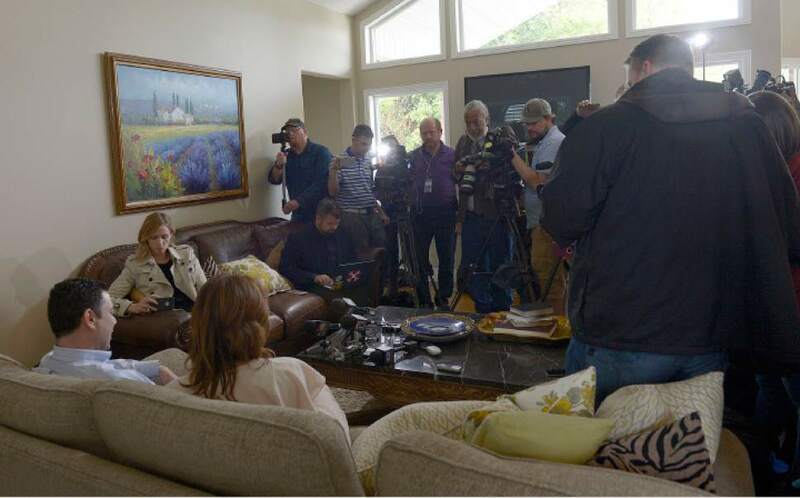 Leah Hogsten | The Salt Lake Tribune Rep. Jason Chaffetz, seated next to his wife Julie, told members of the media at his home in Alpine during an impromptu press conference that he was leaving Congress to spend more time with his family. Chaffetz announced Thursday May 18, 2017 that he will step down from office June 30. In a letter to constituents, the Utah Republican and chairman of the House Oversight and Government Reform Committee, said he did not want a "lifetime career" in Congress, although it is rumored that he is in talks about a job with Fox News and hasn't ruled out a race for Utah governor in 2020. 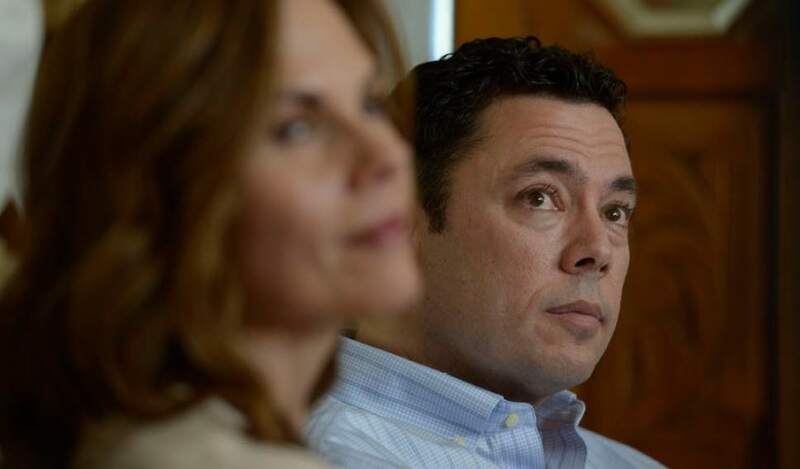 Leah Hogsten | The Salt Lake Tribune Rep. Jason Chaffetz, seated next to his wife Julie, told members of the media at his home in Alpine during an impromptu press conference that he was leaving Congress to spend more time with his family. Chaffetz announced Thursday May 18, 2017 that he will step down from office June 30. In a letter to constituents, the Utah Republican and chairman of the House Oversight and Government Reform Committee, said he did not want a "lifetime career" in Congress, although it is rumored that he is in talks about a job with Fox News and hasn't ruled out a race for Utah governor in 2020. Leah Hogsten | The Salt Lake Tribune Rep. Jason Chaffetz, seated next to his wife Julie, told members of the media at his home in Alpine during an impromptu press conference that he was leaving Congress to spend more time with his family. Chaffetz announced Thursday May 18, 2017 that he will step down from office June 30. In a letter to constituents, the Utah Republican and chairman of the House Oversight and Government Reform Committee, said he did not want a "lifetime career" in Congress, although it is rumored that he is in talks about a job with Fox News and hasn't ruled out a race for Utah governor in 2020. 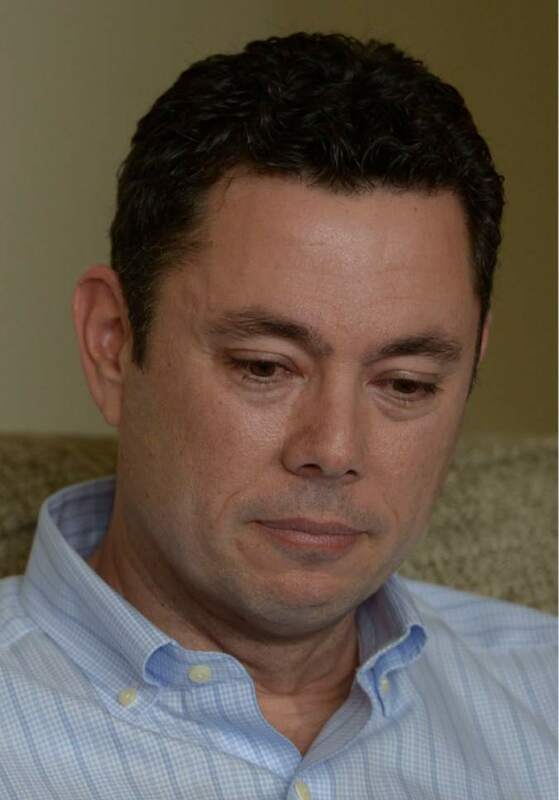 Leah Hogsten | The Salt Lake Tribune Rep. Jason Chaffetz tears up while counting the events in his family's life that he's missed. Chaffetz told members of the media at his home in Alpine during an impromptu press conference that he was leaving Congress to spend more time with his family. Chaffetz announced Thursday May 18, 2017 that he will step down from office June 30. In a letter to constituents, the Utah Republican and chairman of the House Oversight and Government Reform Committee, said he did not want a "lifetime career" in Congress, although it is rumored that he is in talks about a job with Fox News and hasn't ruled out a race for Utah governor in 2020. 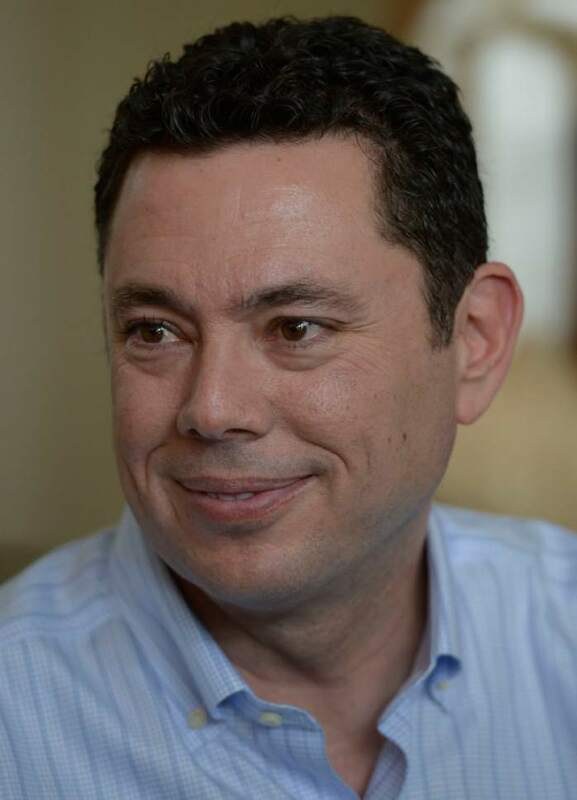 Alpine • Noting that he "never promised a lifetime of service," Rep. Jason Chaffetz announced Thursday that he will step down from office June 30. The decision comes a month after the Republican congressman, handily re-elected in November, first indicated he would likely not complete his fifth term. "I knew from day one that my service there would not last forever," he wrote in an open letter to 3rd Congressional District constituents. At a news conference at his Alpine, Utah, home Thursday afternoon, Chaffetz, asked to identify his biggest regret, pointed to his Oversight Committee&apos;s unfinished probe of former Secretary of State Hillary Clinton&apos;s use of a personal email server. "I think the Clinton email investigation is still not complete," he said. "It is of such importance to the nation." At the same time, he said that starting the Clinton probe, as well as looking into the Benghazi, Libya, attack that killed five Americans and the IRS scrutiny of conservative groups, are among his greatest accomplishments in Washington. Chaffetz, who as chairman of the House Oversight and Government Reform Committee wields unilateral subpoena power, has come under fire in recent months for not probing President Donald Trump&apos;s potential business conflicts and any of his associates&apos; ties to Russia&apos;s meddling in the 2016 election. Since announcing he would leave Congress, Chaffetz has backed more investigations of Trump and this week requested documents to review fired FBI Director James Comey&apos;s claim that the president asked him to halt an inquiry into former National Security Adviser Michael Flynn&apos;s ties to Russia. "I&apos;m skeptical but concerned," about the reported memo, Chaffetz said. "That&apos;s why I launched this investigation." But he expressed no particular regrets about not being able to finish that probe. "Whoever the next Oversight chair is can continue that as well." Chaffetz is rumored to be in talks about a job with Fox News and hasn&apos;t ruled out a race for Utah governor in 2020. He had reserved website domains for that run  and a possible presidential campaign  "just to play defense." He said he has "no compulsion to talk about post-congressional life" and declined to answer questions about Fox News, saying "I&apos;ve talked to lots of different organizations." When pressed about taking a job away from Utah where he&apos;s vowed to stay, Chaffetz said, "those opportunities don&apos;t necessarily mean you&apos;re living on the East Coast." He also assured that he made his decision to leave Congress before shopping around for a new job in the private sector. 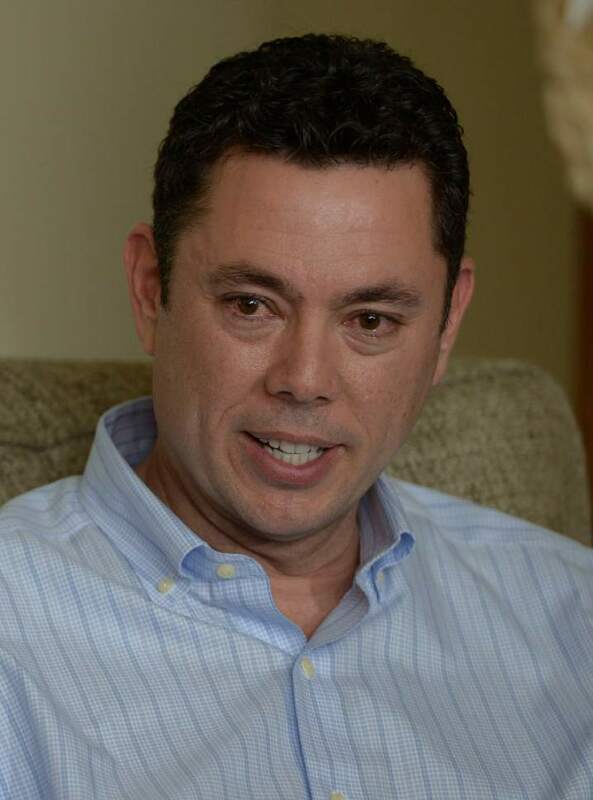 Chaffetz delivered a letter Thursday to Gov. Gary Herbert resigning his post, setting up a free-for-all race to replace him. Herbert has declined to call the Legislature into special election to set rules for replacing Chaffetz, a move that has rankled state lawmakers who say they should be involved in deciding how to conduct a midterm election. Chaffetz, however, defended Herbert&apos;s process. There&apos;s no shortage of Republicans who may vie for Chaffetz&apos;s seat, including state Sens. Deidre Henderson, Margaret Dayton, state Reps. Dan McCay, R-Riverton, Brad Daw, R-Orem, former Rep. Chris Herrod, R-Provo, former independent presidential candidate Evan McMullin, Provo Mayor John Curtis and lawyer Damian Kidd, of American Fork. Curtis said Thursday he was "seriously considering" running but wants to take time to define why he would run and what he wants to accomplish. "I&apos;m not yet ready to say, &apos;Yes. I&apos;m in,&apos;" he said, adding that he wants a selection process that involves the most people. NBA legend and Boston Celtics president Danny Ainge tweeted that he&apos;s encouraging his son Tanner to run for the seat. Tanner Ainge lives in Alpine and posted on LinkedIn that he was contemplating a race. House Speaker Greg Hughes has taken his name out of consideration, arguing that he didn&apos;t want to taint a potential bid because he wants to change the process used to fill the vacancy. On the Democratic side, Kathryn Allen, a first-time candidate, has raised more than $500,000 to run for the seat. Chaffetz, who took office in 2009, says in his letter that he enjoyed serving in Congress but that he knows he was never "indispensable." "I know others can and should serve," he wrote. "The House is known as the &apos;People&apos;s House&apos; because it is made up of a cross section of ordinary Americans who represent almost every walk of life  as it should be. While remaining true to my principles I have made the effort to &apos;reach across the aisle.&apos; I count many Democratic members as my friends. I hope whoever replaces me will do even better." Though Chaffetz made the decision to depart early in March, he said that has not pushed him to be more aggressive in probing the Trump administration. "I&apos;ve always felt secure in my skin," he said. And pointing to his college experience as a Brigham Young University football place kicker, he described himself as "calm, cool, collected and confident." He did not mention the Oversight Committee in his constituent letter, though he said he may step down from his chairman position early to allow for a "transition period" with the next leader, who will likely shape any investigations into the president and possible collusion with Russia. Despite recent foot surgery that&apos;s limited his mobility, Chaffetz will return to D.C. on Monday to work out "exactly what that looks like." 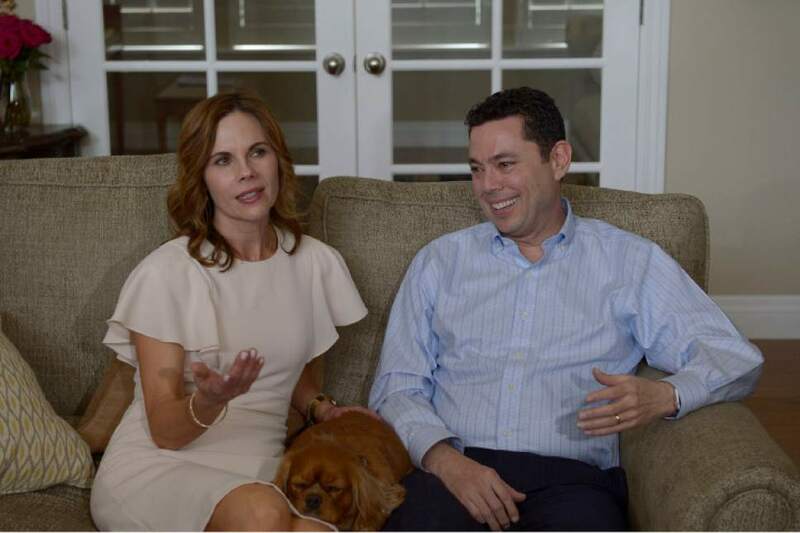 Sitting next to his wife, Julie, and their dog, Ruby, Chaffetz promised his decision to leave Congress  which he joked came after "a little bit of a midlife crisis"  was for his family. "There&apos;s so many birthdays and things that I&apos;ve missed," he said, becoming emotional, "and that&apos;s hard." Chaffetz assured that he is "not the only one who can do this job," though he&apos;s enjoyed the interactions with constituents, even at his raucous February town hall in Cottonwood Heights. "The republic will survive without me. I promise." The congressman, though, said it&apos;s time to retire the cot that he sleeps on in his Washington office while away from home. He said: "I&apos;m done with that thing."